For some reason, marshmallows seem like a super hard thing to make at home. It's basically something that doesn't even cross one's mind. Just, you know, let's go to the grocery and pick some up. Same goes for the fluff stuff. The cream. The creme. The jar of marshmallow delight! But you know what? Marshmallow creme is even EASIER to make than homemade marshmallows, which are already pretty easy to make yourself. And you know what else? It's SO MUCH BETTER than store-bought. Like, whoa. Why ever buy the jar of stuff again? Seriously. It has a multitude of uses in a variety of different recipes, from fruit dip to fudge to homemade fiber bars. Or you know what else is really amazing? Just plop some of it on top of some pumpkin ice cream. Seriously. DO IT. I did it and it was like one of those rainclouds opening to the sunshine moments. Awwwwwaaaaahhhh! Now, I didn't need a candy thermometer for this, but then I tried to make some fudge for the first time, and it didn't set, which I guess means it didn't reach the right temperature, which means I probably should get a thermometer. Dang it! Oh well. I shall try again and triumph! Also, I'm working on a fluffernutter bar recipe that uses this stuff too, so stay tuned for that. I mean, a real, honest to goodness, recipe I'm making up myself based on others'! I don't do that often, so whoa. Pressure time. Peanut butter plus marshmallow creme is surely made of unicorn dreams, so hopefully it will all be wonderful. But, even if you want to just make a fluffernutter sandwich in the meantime, go for it. Or if you want to just stick your finger in and lick it by itself, well, I'm not stopping you. Have you had homemade marshmallow crème? If not, you are missing out. It’s amazingly easy and delicious, way better than store bought. 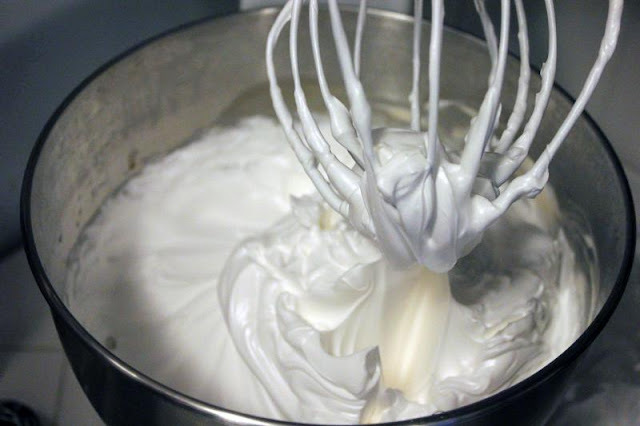 With an electric mixer using a whisk attachment, beat the egg whites and cream of tartar together until light and frothy. This shouldn't take too long. With the mixer still running, slowly pour in 2 Tbsp sugar. Beat this until soft peaks form. Set aside for now. 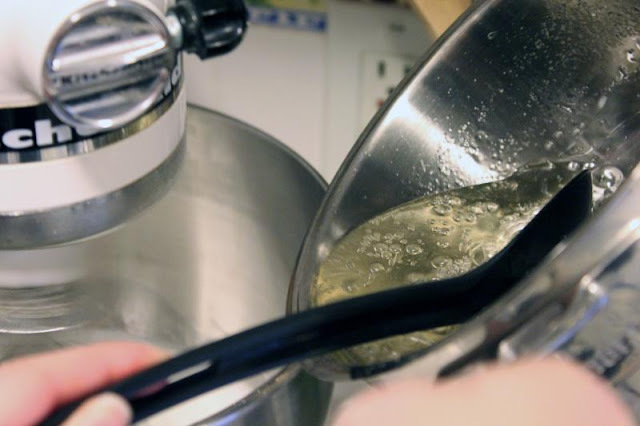 In a small saucepan, combine water, corn syrup and remaining 2/3 cup sugar. Place over medium heat and cook until boiling. Once boiling, cook the mixture, stirring, until it reaches the firm ball stage (a note on that below), or when your candy thermometer reads 242-248F. This should take between 10-15 minutes. Immediately remove from heat. 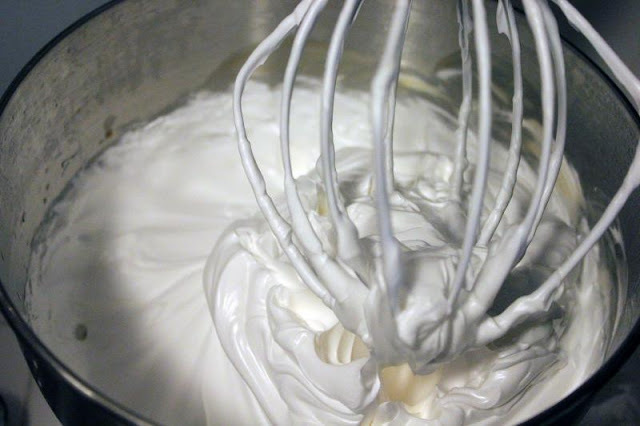 With the mixer on low, slowly add the hot syrup to the egg-white mixture (you'll want to drizzle this down the side of your mixture to cool it down as it goes in). 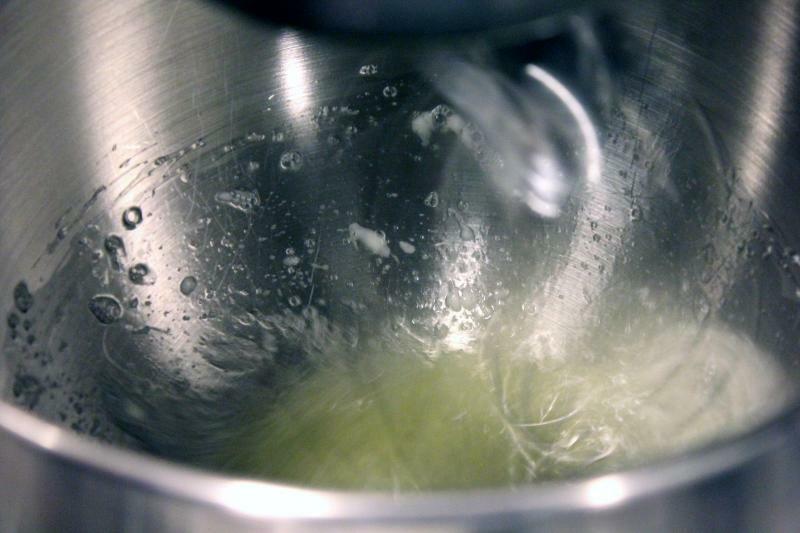 Increase the mixer speed to high once you've added it all, and beat for 5 more minutes. 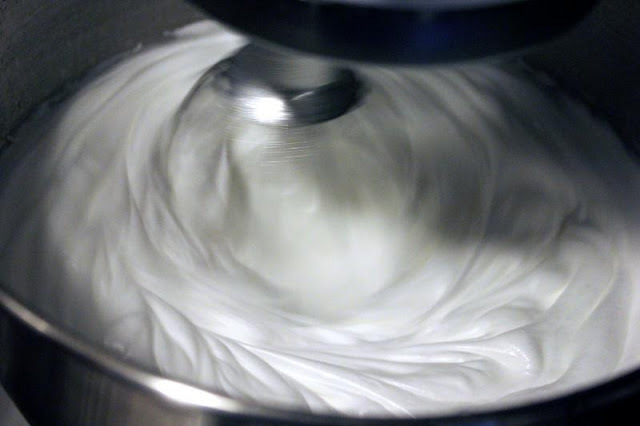 Add in the vanilla and continue to beat until the mix looks like your favorite marshmallow fluff, should take about 1 more minute. *What is the firm ball stage? When you don't have a candy thermometer, here's what you do... Drop a small spoonful of your hot liquid into an icy cold glass of water. Lift it back up with your spoon. If it keeps a ball shape before dissolving again, you're ready to go. If it just plops into nothingness, it's not ready yet. Make sense? This is how I get my egg whites. I don't have some kind of special egg separator. Just crack and move the yolk back and forth between the two halves of shell while the whites fall into the bowl. You'll need three of these. What can you do with your leftover yolks? Make some ice cream! 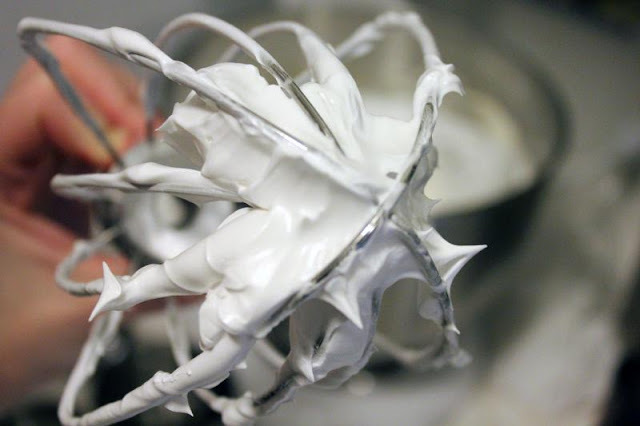 Whisk that up with the cream of tartar until light and fluffy, then add in 2 tablespoons sugar. 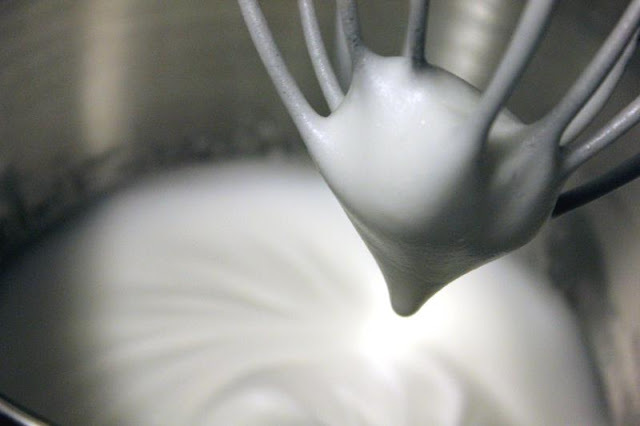 Then whisk that until soft peaks form, like so. Set aside for now. 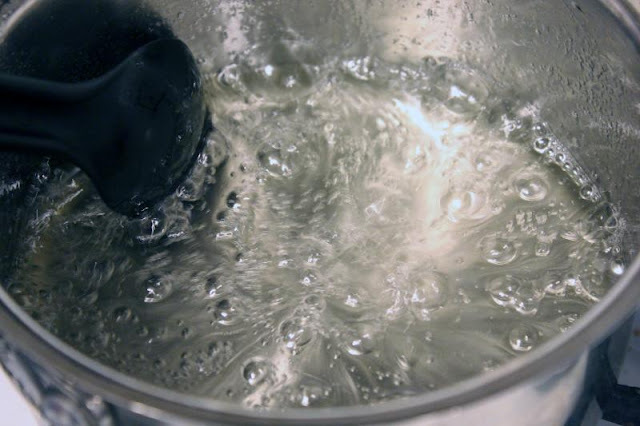 In a medium saucepan, bring to a boil over medium heat the water, corn syrup and remaining sugar. Once it's boiling, cook for another 10-15 minutes until the mixture reaches the firm ball stage (a note on that above), or when your candy thermometer reads 242-248F. Take that off the heat! 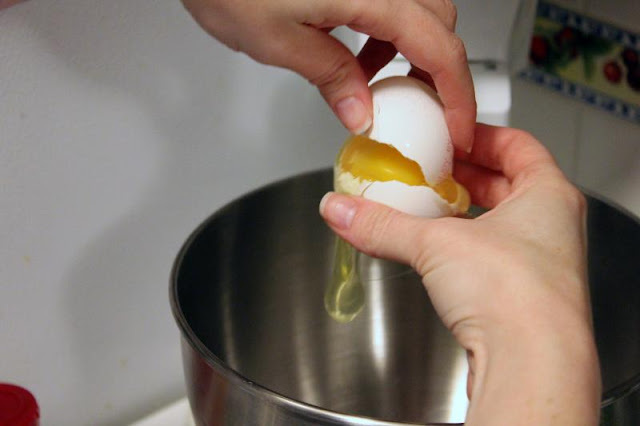 With your mixer on low, slowly pour the hot syrup into the egg mixture. You'll want to pour it down the side of the bowl so it cools a little as it goes in. Then start that sucker to beating! Beat it on high for five minutes. 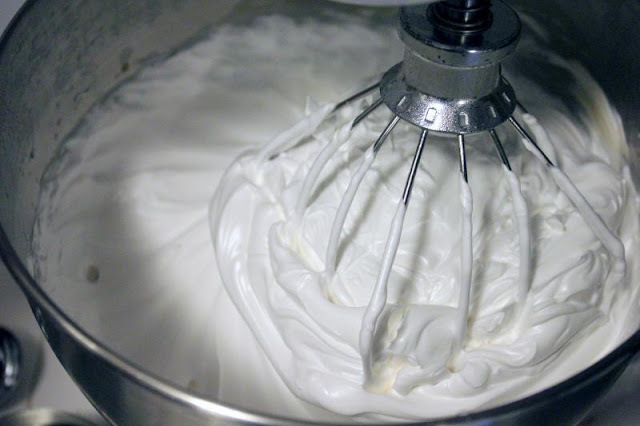 Add in your vanilla, then beat for one more minute. Oh my. Oh me oh my. Do you want to stick your face in it? I think you do. It's fluffy. It's delicious. It's so much better than the stuff you can buy at the grocery store. Ha! I think I got a good version of it yesterday, will have to post the recipe soon!